Students from James Madison University in the United States, with staff from the Faculty of Nursing at the Terres de l'Ebre Campus. 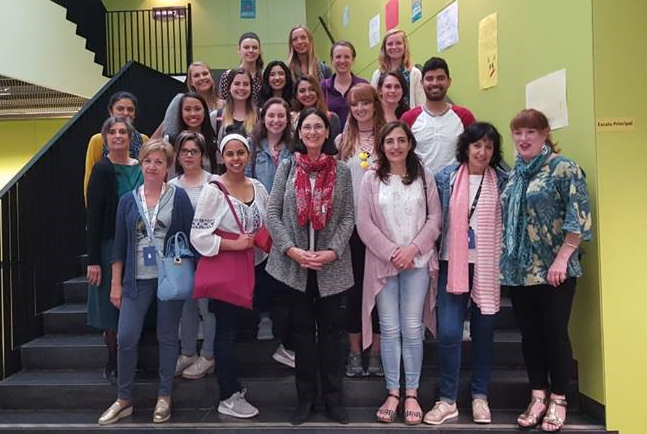 From 14 May to 1 June, fourteen students of Nursing, Medicine, Occupational Therapy and Physiotherapy from James Madison University in the United States attended the URV course “The health system in Spain: an intercultural exploration of illness and wellbeing”. It is the third time that the Faculty of Nursing has played host to students from the American university as part of a Study Abroad programme that combines a certified academic programme with cultural activities. The course gives an introduction to the Spanish health system which, in contrast to the American system, provides universal healthcare. There is also a workshop on the instruments and vocabulary used in the ambit of healthcare, a visit to a centre of complementary techniques and visits to the Joan XXIII and Santa Tecla Hospitals in Tarragona, the Sant Joan Hospital in Reus, the secondary hospital in Cambrils and the Llevant Primary Healthcare Centre in Tarragona. There is also a visit to the teaching unit in Tortosa where students undertake internships. Among the features that distinguish the Faculty of Nursing’s programme are the clinical practice observations that the students carry out in health centres in and around Tarragona. The visitors either study Spanish at their home university in America or speak it as their mother language. And, in contrast to the Spanish academic systems, they spend two years studying health sciences before specialising in their chosen areas.